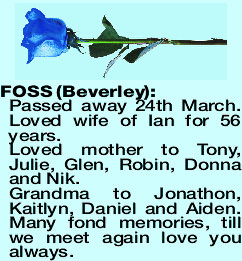 FOSS BEVERLEY Passed away 24th March. Loved wife of Ian for 56 years. Loved mother to Tony, Julie, Glen, Robin, Donna and Nik. Grandma to Jonathon, Kaitlyn, Daniel and Aiden. Many fond memories, till we meet again love you always. 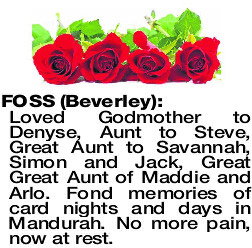 The Funeral Service for Mrs Beverley Foss of Erskine will take place in Bowra & O'Dea's Chapel, 2 Leslie Street Mandurah commencing at 1:30pm WEDNESDAY (3.04.2019). No flowers by request donations in lieu to Kidney Health Australia. FOSS BEVERLEY Mother to Tony and Julie. 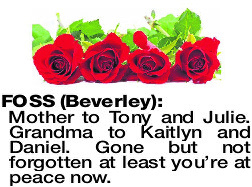 Grandma to Kaitlyn and Daniel. Gone but not forgotten at least you're at peace now. 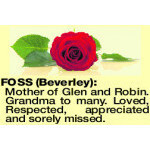 FOSS BEVERLEY Mother of Glen and Robin. Grandma to many. Loved, Respected, appreciated and sorely missed. Loved sister to Murray (dec), sister-in-law to Kay. 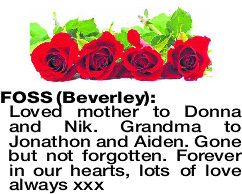 Loved aunty to Denyse, Jacquie (dec) and Louise and Families. Sailing once again the talk of the day. Deepest sympathy to Ian and families on your sad loss. Terry, Peter, Lindsay, Megan Winch and families. 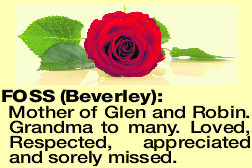 Our deepest sympathy to Ian and family on the sad passing of Bev. The Bevan cousins Patti, John, Betty and Peter and their families. We extend our deepest sympathies to Ian, Tony, Glen, Donna and families at the sad loss of a very dear aunty to Denise and Craig, great aunt to Keara-Lee, great great aunt to Elizabeth, Isla and Charles and sister- in-law to Marlene (dec) and David. 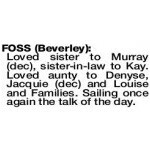 FOSS BEVERLEY Loved sister of Vic (dec) and sister-in-law of Gwen, aunt to Kelly and Todd and great-aunt to Mitchell. Reunited and chatting with her brothers. Love and sympathy to all who loved her. FOSS BEVERLEY Loved Godmother to Denyse, Aunt to Steve, Great Aunt to Savannah, Simon and Jack, Great Great Aunt of Maddie and Arlo. Fond memories of card nights and days in Mandurah. No more pain, now at rest. Our love and thoughts are with you Ian and your beloved family at this very sad time. 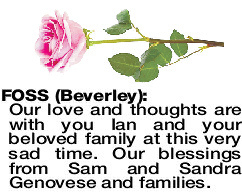 Our blessings from Sam and Sandra Genovese and families. 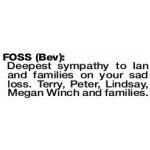 Condolences to Ian and family on the passing of our good friend Bev.